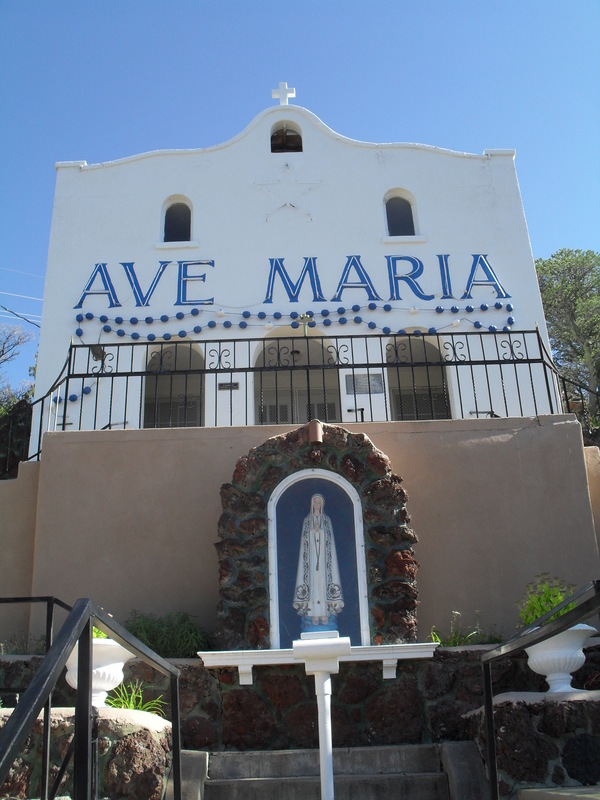 I visited the Ave Maria Shrine in Trinidad, Colorado twice in September 2014 when I was in town to see friends. I’d seen the shrine listed as one of the town’s attractions but hadn’t sought it out yet when my friend and I stumbled upon it. We were heading east on Benedicta Avenue, going to the senior living center so my friend could drop off a job application, when we saw the shrine rising out of the trees. We had no pressing obligations after dropping off the job application, so we decided to take some time to explore. 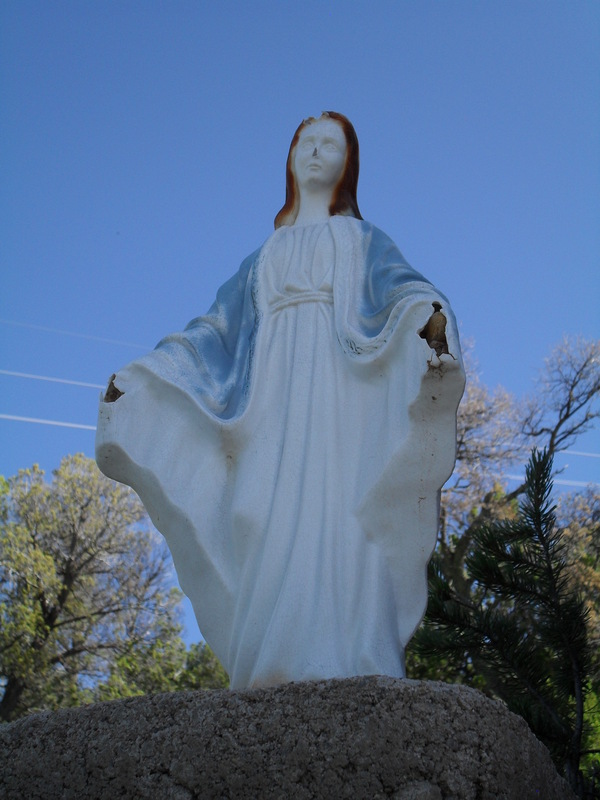 There are lots of statues of the Virgin Mary at the Ave Maria shrine. I took this photo of one of them. To visit the inside of the chapel, please call our Trinidad Area Catholic Pastoral Center at (719) 846-3369, extension 14, Monday through Friday, 8:30 am to 4:30 pm, except holidays. We will try to get someone to open up for you. It is best to make arrangements some days in advance. My friend and I went all the way to the top and were able to peek into the chapel through the metal screen over the windows. The chapel is small, but very beautiful, and we both wanted to go inside and look at it more closely. Some of the statues at the shrine are damaged, perhaps due to being aged by the elements, or perhaps from vandalism. 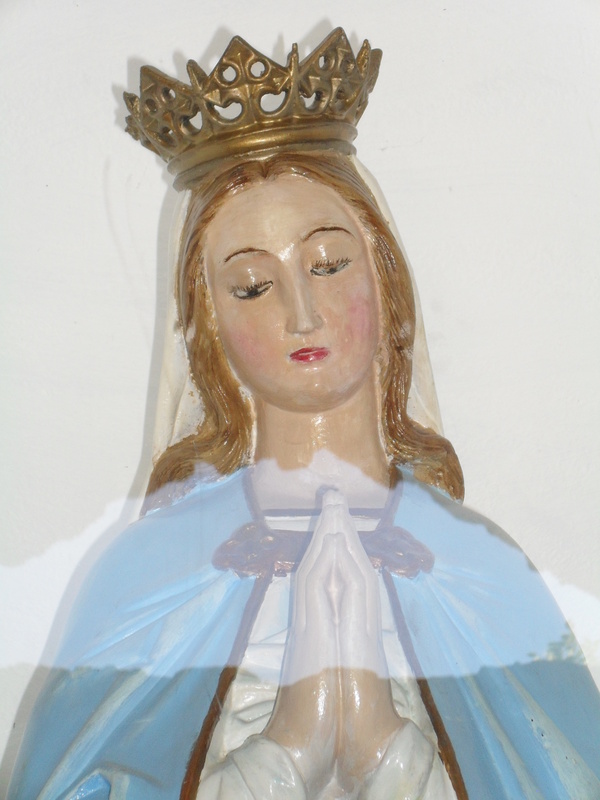 I took this photo of a statue of Mary missing her hands and nose. In 1908 a Trinidad physician, was leaving Mount San Rafael Hospital, after all night duty. It was already dawn, and although a snowstorm was in progress, he was persistent to make it home. As he was leaving the hospital he noticed a glimmer of light flickering on the hill directly behind the hospital. At first, he gave it little attention, believing the spray of snow flurries were creating an illusion. Then the possibility of someone hurt or stranded captured his attention. Even at the early morning hour and in the middle of a snowstorm, the good doctor ascended the hill where the light originated. The frozen ground and steep slope made the climb very hazardous in his pursuit to reach the small clearing. Upon reaching the clearing, he was spellbound at the sight of a statue of the Blessed Virgin Mary, with a lit candle flickering at its base. Awed by the vision of such a beautiful statue, he reached out and touched its outstretched hand while calling out to see if anyone was nearby. After calling out for several minutes and no one answered, he decided to stay by the statue until daybreak. When word of the doctors discovery spread throughout the community, reactions were varied. some believed that some person had to have been on the hill, while others were skeptical as to how a 250 pound statue could have been left on the hill, kept a candle lit during a blizzard and then disappear into thin air. But the more faithful residents accepted this as a divine sign from God that a shrine should be built in Her honor on this mountain. The early settlers erected a small lava rock shrine, where Our Lady was placed, and the faithful made daily pilgrimages and offered prayers to God through here intersession. The information offered is a little confusing, perhaps mostly due to the poor writing skills of whoever wrote down the legend. Who was the doctor? Didn’t he have a name? If it was “already dawn” when he left the hospital, why does the story say “he decided to stay by the statue until daybreak”? And what exactly disappeared into thin air? The 250 pound statue? The person who hauled the statue up the hill then left it there? Ah, mysteries. The website also gives factual information about the chapel. Plans for the present chapel were begun in 1934. The chapel was built through the efforts of a group of local Catholics much devoted to Mary. They were known as the Circolo Mariano. 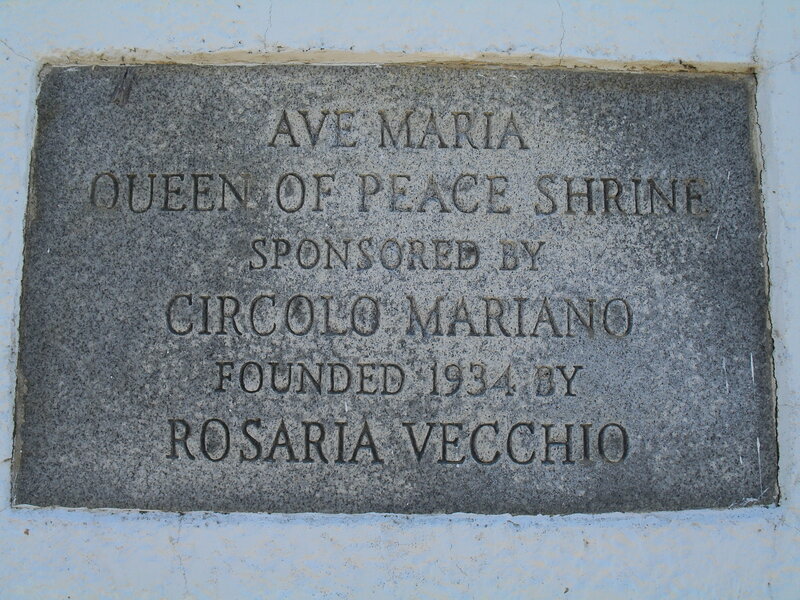 They worked under the leadership of Rosaria Vecchio. In 1962, vandals destroyed the statue., breaking it into 279 pieces. It was almost a total loss, but thanks to the patience and skilled hands of Sam Arguello and his son Anthony, it was restored and placed inside the Shrine, above the altar, where it remains today. Over the years many such faithful persons have helped develop and maintain the shrine and its surroundings. Many of them are commemorated by name both inside and outside the chapel. This shrine continues to be developed and maintained through the generosity of many persons both in this area and visitors from many states and other countries. I took this photo of a plaque at the shrine. After seeing peeking at the chapel through the windows, my friend and I and my friend’s girlfriend wanted to go inside the chapel. I called the phone number on the Shrine’s website and made an appointment to see the chapel. We were supposed to be met by one or more of the parish’s maintenance workers who would unlock the door to the chapel, but no one ever showed up to let us in. We were really disappointed. I wish the man I talked to in the parish office had just told me no instead of saying someone would let us in but not making it happen. No one ever called to apologize, and I didn’t call back to ask any questions. 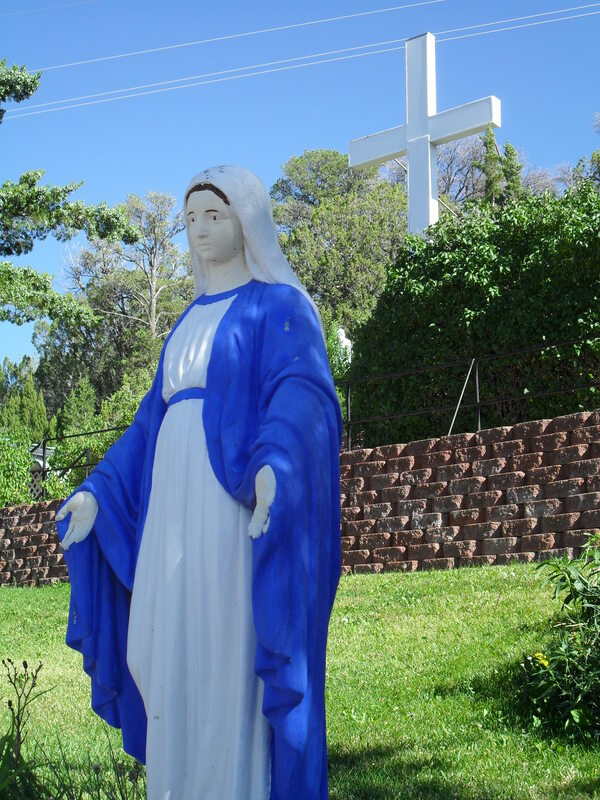 I took this photo of another of the many statues of Mary at the Ave Maria shrine. I think this one was behind glass. The shrine is very tranquil, and I enjoyed my visits very much. I recommend it as a stop for anyone visiting Trinidad, but especially for folks who are big fans of the Virgin Mary. 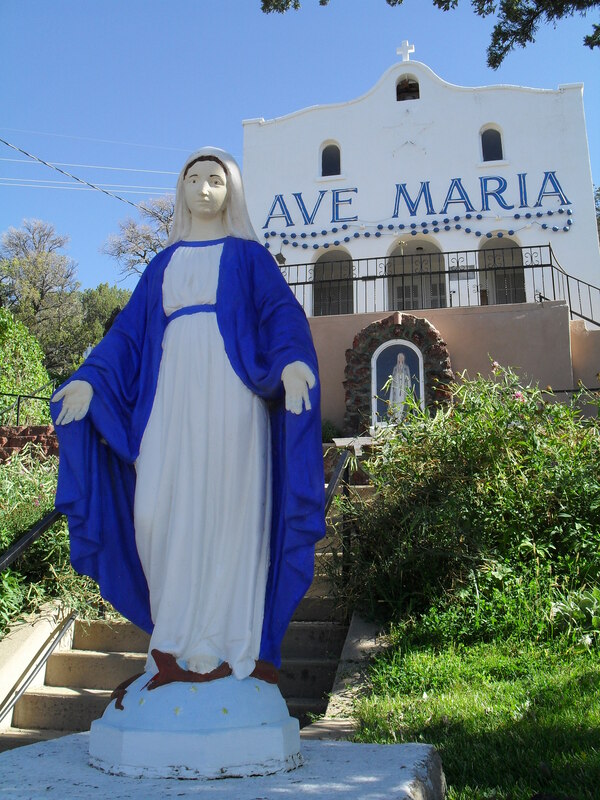 This photo I took of the Ave Maria shrine in Trinidad, CO really shows the giant rosary.